Random House Trade Paperbacks, 9780812981674, 352pp. In the slums of Accra, Ghana’s fast-moving, cosmopolitan capital, teenagers are turning up dead. Inspector Darko Dawson has seen many crimes, but this latest string of murders—in which all the young victims bear a chilling signature—is the most unsettling of his career. Are these heinous acts a form of ritual killing or the work of a lone, cold-blooded monster? 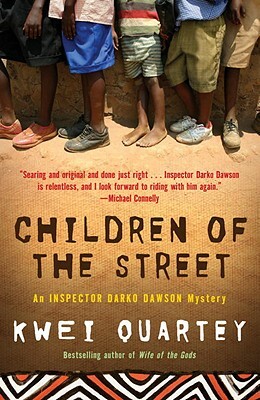 With time running out, Dawson embarks on a harrowing journey through the city’s underbelly and confronts the brutal world of the urban poor, where street children are forced to fight for their very survival—and a cunning killer seems just out of reach. Kwei Quartey was raised in Ghana by an African American mother and a Ghanaian father, both of whom were university lecturers. Dr. Quartey practices medicine in Southern California, rising early in the morning to write before going to work.